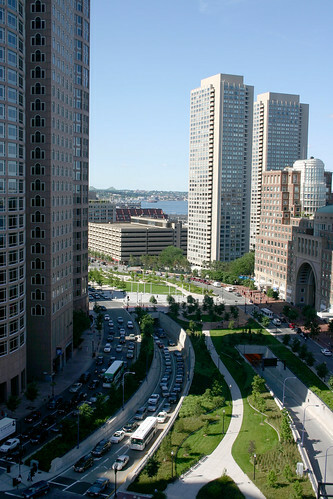 The Rose Kennedy Greenway was supposed to transform downtown Boston, and while the Big Dig has had some impact on traffic, its above ground success have been far fewer, at least in the three years since the project was completed. At least two major developments have been forestalled because of competing demands on the Greenway’s open space, which itself has not been a smashing success, and now the Boston Globe reports the demise of yet another cultural institution that had been planned for the 1.5-mile park. The latest loss is the New Center for Arts and Culture, an $80 million project designed by Daniel Libeskind that was meant to foster diversity and dialogue between disparate groups. Other of the glassy, glitzy victims—blame falls largely on poor fundraising due to the economy—include a new YMCA, Garden Under Glass, and the Boston Museum, which has since relocated to a different site where it also struggles to get off the ground. After the jump, a graphic from the Globe breaks the blunders down.